I took a week off of work last week to attend Star Days in Harrisburg, PA. This is an annual event that brings together members of Star Riding and Touring for fun, friendship, and riding. 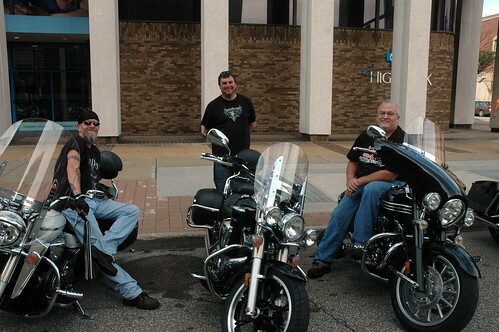 Joining me on the ride out to Harrisburg were two members of our Chapter, John and Jeff. I wanted to ride Route 30 most, or all, of the way to Harrisburg, as it is a great route (Thank you, Denny, for the assist on the route through Pittsburgh). However, by the time we made it to Irwin, PA, all of us had enough of Route 30, it’s 40mph speed limit, and the oppressive heat. The road was really good, the towns we passed were interesting, and it was a pleasurable ride. But it was time to get on the turnpike and get to the hotel, and air conditioning, as quickly as possible. We made a tactical error on the turnpike, only stopping for gas and refreshments (lots of Gatorade and water). This made for a pretty grueling ride, an error we would not make on the way back to Cleveland. Wednesday, we started the day with a Feed the Children ride. We loaded up our bikes with boxes of food, rode a police escorted route to a distribution point, and helped distribute food to 800 families. Because our Chapter was in the Top Ten of all chapters for money raising, we were afforded the right to ride in the front of the group. After we were done, John, Jeff, and I headed back to the hotel to take advantage of the bike wash (our bikes were pretty filthy from the ride to Harrisburg), to have some maintenance done to them, and to check out the vendor area. I availed myself to the Yamaha tent to ride a Stratoliner and a 1300 Deluxe. 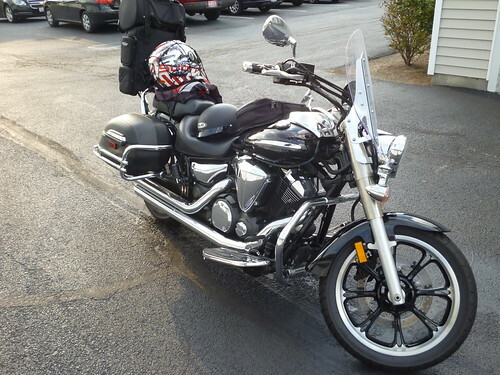 On Thursday, I rode the VMAX. Twice. It was the most fun I’ve ever had on two wheels. Melt your face off performance. After all of the demo rides and after John had his oil changed, we headed off for Thurmont, MD and Catoctin Mountain Park. I’ve driven through there on several occasions and knew it would be a great bike ride. It was, as I scraped floorboards on several occasions. The cool, fresh air was welcome respite from the heat. From there, we rode to Gettysburg and to take the bus tour (air conditioning cannot be underestimated). It was the first time I’ve had a guided tour of Gettysburg and it was wonderful. On the way back to the hotel, we had to stop on the side of Route 15 as we could see rain ahead of us. We geared up for it and rode on. For about 15 minutes, it was wonderfully cool. And wet. Very wet. Then, it was over and the heat returned. Since I was head to toe in rain gear, I was extra hot. How hot? It was like I was in an oven bag, cooking up with some potatoes and carrots. When we stopped for gas, I stripped off the gear as fast as I could, as if I had fire ants in my pants. Friday, we headed back to Cleveland. This time, however, we made plans to stop at every other rest stop on the turnpike. To gas up and to replenish our fluids. It was a great plan. Just before Pittsburgh, we checked the weather and decided it would be a good idea to gear up for rain. Back into the rain suit and full face helmet for me. The temperature dropped (yeah!) and the rain came. But we soldiered onward. At the first rest stop in Ohio, we stopped, stripped out of the rain gear, and gassed up. Looking at the weather map, we were heading into some rain. But we decided that there was no way we were going to stay in the rain gear, it was that hot in the gear. Not too long after that, we hit the rain. Torrential rain. Rain so hard that we passed about twelve cars sitting on the side of the road waiting out the rain. We waved at them as we rode by. “Pussies,” I said to myself. Then it stopped. And I started laughing. Water was pouring off of me, my front was soaked, my back dry. Every time I turned my head, for example to move into another lane or look at the scenery, water came off of me. It was hilarious. Except for my wet socks inside my boots. But it didn’t take long to dry off in the heat. We made it home with no more weather related issues. Nor any issues with drivers. 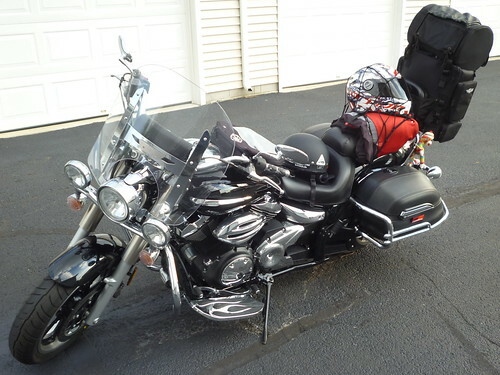 Some have inquired as to how I travel on the bike, so here are two pictures of it, loaded for the trip. The Flickr photos have notes, which should answer most questions. Plus, you can see the enhancements I’ve made to it. Next year, Star Days will be in St. Charles, MO. When the week was over, I had ridden 1303 miles. My bike, which I purchased new, with zero miles, in April of 2012, now has 16, 713 miles on it. I think I love riding. A lot. This past weekend, I was invited to ride with Star Chapter 300 on their July ride to Marietta, OH. This ride, through southeastern Ohio, included several portions along some of the best motorcycling roads in Ohio (State Route 555 and State Route 26). Roads like these are not available in northeastern Ohio, so I *had* to join the Chapter and ride with them. Just looking at the map brings a smile to my face. Look at those curvy, winding roads. While the day started overcast, it quickly turned sunny and warm. A perfect start to the ride. Everything was going well until we rolled into Somerset, OH. There, we had to stop for about an hour while the town enjoyed a July 4th parade. When we were finally able to get riding, it was more great roads to McConnelsville, OH. I believe that I was smiling the entire way, it was that much fun. After a lunch stop in McConnelsville, we bid farewell to two bikes and it was off to Marietta. Phenomenal roads and scenery greeted us. And so did some rain. We didn’t stop to gear up, even though we did pause to decide if it was worth it to get in the rain gear. After a gas stop in Marietta, it was off to ride State Route 26, one of the best motorcycling roads in Ohio, which runs through Wayne National Forest. In a word, awesome. On the way north, we stopped to see a covered bridge, a pretty popular stop along 26. I was fortunate to see a wild turkey, and, what I think were turkey vultures (feasting on fresh road kill, which was pretty abundant). I also saw some baby goats, which were a major distraction for me. Those damn goats made me lose my line in a curve and I ended up dropping the bike, as I rode onto the gravel on the side of the road. Thankfully, the engine guards and saddle bag guards prevented any damage to the bike. And my Kevlar jeans and jacket prevented any damage to me. Although I am a bit sore from where my unprotected ribs hit the pavement. Lesson learned: ALWAYS, always focus on the road. After taking a little break to allow me to settle down, we continued onward to Route 78. One experience on Route 78 is worth noting. 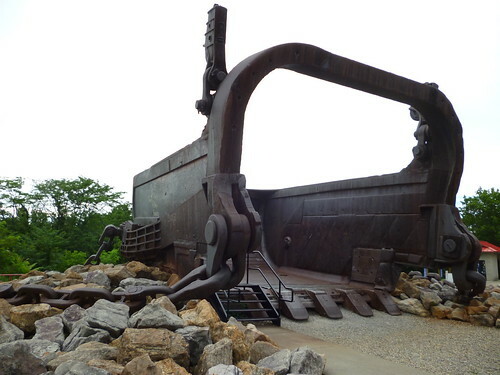 And, if you are ever in the area, or near it, you really need to stop and see the bucket from Big Muskie. Pictures are one thing, seeing this monstrous bucket up close is totally another. And the view from Miner’s Memorial Park is incredible. It is said that on a clear day, you can see the curvature of the Earth from the park. It was about when we rode into McConnelsville that it started to rain again, but sadly it was also where I said “goodbye” to the other riders. We shot up Route 60, them to get on Route 70 and head back to Columbus and I to check into a hotel in Zanesville. Roughly 240 miles, we rode from about 11AM until close to 8PM. A few weeks ago, 23 motorcycles and 29 people (myself included) rode around Lake Erie. It was a trip I planned to ride, probably by myself, but when two members of Star Touring and Riding, Chapter 331, announced that they would be leading a ride, I quickly signed up to ride with them. When I returned, I had ridden 750 miles, through 4 states, 2 countries, and 1 province. We stopped for the night in London, ON, CA and Niagara Falls, ON, CA. Both overnight stops were well planned; there were ample restaurants/bars within walking distance of the hotels (very important when your only mode of transportation is on motorized two wheels). Overall, the Canadians we interacted with, be it service station attendants, bar/wait staff, curious onlookers, etc., are very friendly people. It still amazes me that when you ride, people will approach you to talk about your bike, their bike, your travels, their travels, or just to say “Hi,” and ask “where are you going?” Major credit when you tell them that you are riding around Lake Erie. On the motorcycle. The US does not have a corner on the patriotism market. Everywhere we rode, Canadian flags were flying, banners were proclaiming support for their armed service members, cemeteries had little Canadian flags marking graves of former service members. The north shore of Lake Erie is nothing like the south shore. The north shore smells wonderfully natural. It is much more open. Access to the lake doesn’t seem as limited as it is on the south shore. Restaurants and bars can be found right on the shore, very unusual for the south shore. There are spectacular vistas from the roads paralleling the lake, unbroken by either housing or industry. You don’t get a stamp in your passport from Canada, that would increase the wait times at the border. If you want a Canada stamp, your best bet is to fly into Canada. The road signs are in kilometers. At first, seeing a distance of 195 to London, ON, CA, was a bit of a shock. But then, after performing a little mental math, the distance wasn’t so bad. You have to keep the mental gyrations simple whilst on a bike, especially when you are traveling in a group and to keep the surprises to a minimum. Holy crap is having a US cellular phone expensive to use in Canada. It was about $0.89/minute (plus roaming) for a call, $2.05/MB for data. Once we stopped in Leamington, Verizon was nice enough to text me my new “plan,” but I decided to simply turn the phone off. Especially since both hotel’s wireless wasn’t too accessible and there is no wireless on the bike. Since no one was riding on my bike with me, I have limited photos of the adventure, but what I did take are posted here. 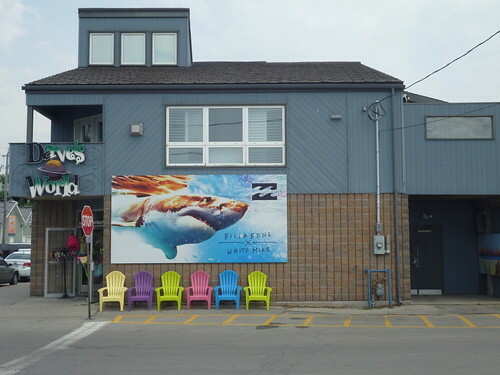 Here’s a shot of a store in Port Dover, ON, CA, a wonderful little town on the shore of Lake Erie. There will be another Adventure next year, not around Lake Erie, but somewhere else in Canada. I’m already looking forward to it. You are currently browsing the Gregg Eldred blog archives for July, 2013.